Bronze garden statues are built to stand the test of time. For thousands of years they have been erected to honor great heroes and leaders of the past. Today they also capture more playful scenes like children playing, dancing and embracing life. With splashes, sprinkles and giggles, these childhood friends invite you to give way to your own memories of the unleashed joy of summer water fun! 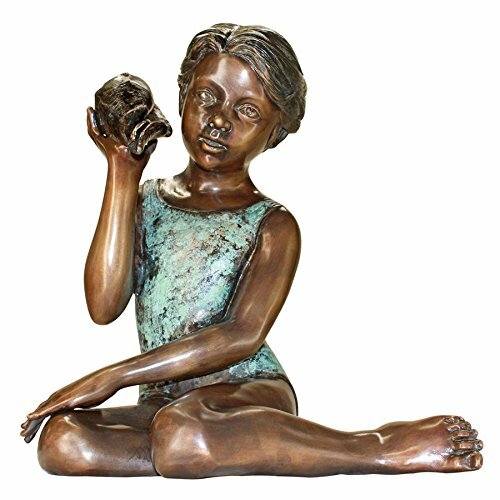 Our distinctive, 360-degree, over three foot tall bronze child statue is expertly finished with a hand-applied, classic sepia bronze patina accented by an antiqued emerald Verde patina to bring out the amazing detail. Cast and crafted one piece at a time in the traditional lost wax method, which highlights the detail of the sculpt and guarantees lasting beauty. Sure to be a garden focal point, this Design Toscano, heirloom-quality bronze children statue conveys that you take the exterior of your home as seriously as the interior. Piped to splash water from the center font, you may optionally cascade flowing water from the 400 GPH pump into your pond or fountain. Simply add the optional recirculating pond pump kit to create beautiful water music for your garden. Accommodates Toscano Pump Kit DR-400, sold separately. 27"Wx14½"Dx40"H. 76 lbs. 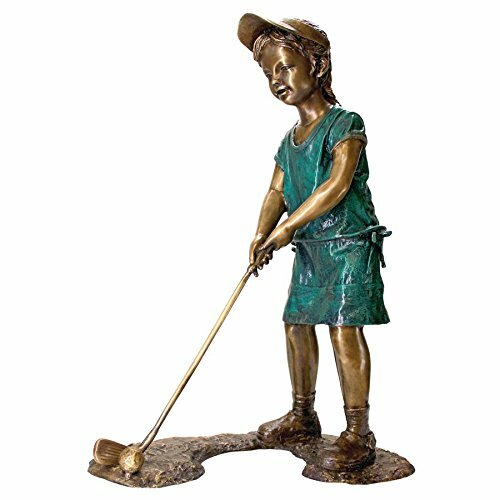 If you love to share the sport of golf, Gabrielle is ready to tee up one of our favorite bronze sculptures with her angled cap and ready smile! Our impressive, 360-degree, almost three-and-a-half-foot-tall bronze duffer statue is expertly finished with a hand-applied, classic sepia bronze patina accented by an antiqued emerald Verde patina to bring out the amazing detail. Cast and crafted one piece at a time in the traditional lost wax method, which highlights the detail of the sculpt and guarantees lasting beauty. Sure to be a garden focal point, this Design Toscano, heirloom-quality bronze child statue conveys that you take the exterior of your home as seriously as the interior. 29"Wx17"Dx40"H. 57 lbs. If your childhood memories include spending time with family coaxing the bounty of God's green Earth, you'll know how good time spent outdoors is for both the body and the soul! 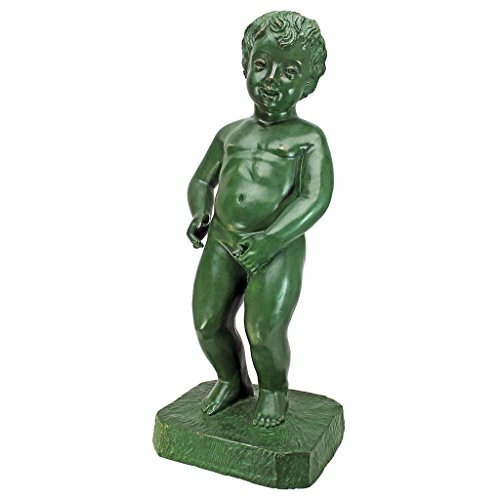 Our impressive, 360-degree, almost-three-foot-tall bronze boy statue is expertly finished with a hand-applied, classic sepia bronze patina accented by an antiqued emerald Verde patina to bring out the amazing detail. Cast and crafted one piece at a time in the traditional lost wax method, which highlights the detail of the sculpt and guarantees lasting beauty. Sure to be a garden focal point, this Design Toscano, heirloom-quality bronze child statue conveys that you take the exterior of your home as seriously as the interior. Optionally, plant the wheelbarrow with flowers of your very own! 38"Wx33"Dx29"H. 68 lbs. Animals just "know." Holding a tiny hand aloft for the whisper soft kiss of a butterfly, this young girl marvels at nature's majesty in the way we long to remember for a lifetime. 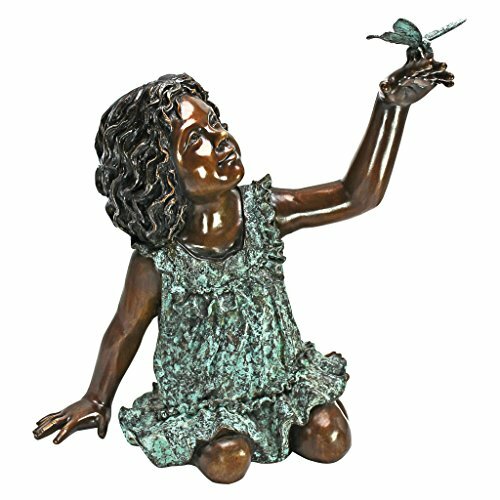 Our impressive, 360-degree, almost two foot tall bronze childhood statue is expertly finished with a hand-applied, classic sepia bronze patina accented by an antiqued emerald verde patina to bring out the amazing detail. Cast and crafted one piece at a time in the traditional lost wax method, which highlights the detail of the sculpt and guarantees lasting beauty. Sure to be a garden focal point, this Design Toscano, heirloom-quality bronze girl statue conveys that you take the exterior of your home as seriously as the interior. 18½"Wx11"Dx22"H. 31 lbs. Constant companions, confidants and best friends, a girl and her dog are not easily parted! 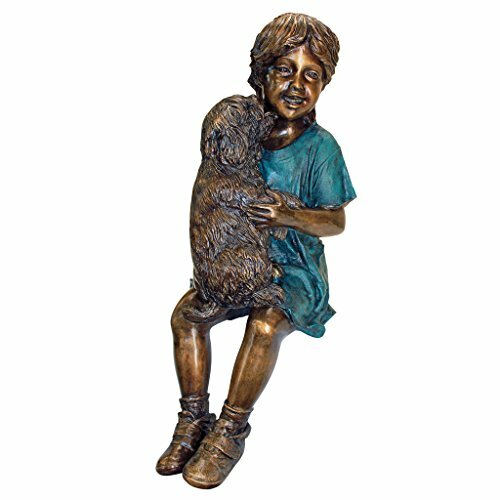 If you've ever had a canine you cherished like family, our impressive, 360-degree, almost-three-foot-tall bronze statue will pull at your heartstrings. 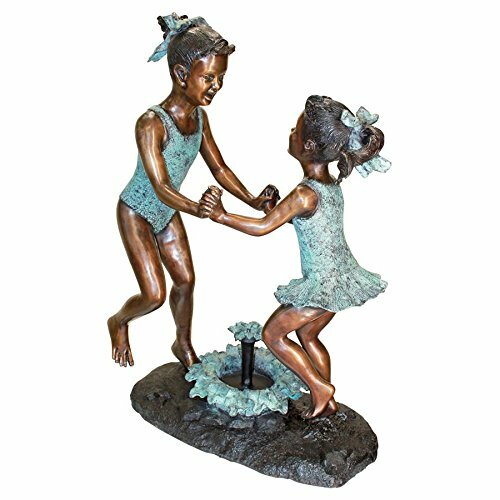 Our childhood statue is expertly finished with a hand-applied, classic sepia bronze patina accented by an antiqued emerald Verde patina to bring out the amazing detail. Cast and crafted one piece at a time in the traditional lost wax method, which highlights the detail of the sculpt and guarantees lasting beauty. Sure to be a garden focal point sitting on your patio chair or garden wall, this Design Toscano, heirloom-quality bronze girl statue conveys that you take the exterior of your home as seriously as the interior. 13"Wx22"Dx34"H. 49 lbs. Looking into those big puppy eyes, how could a parent say no? 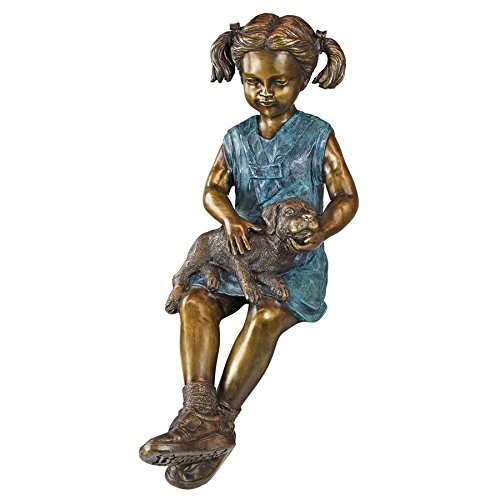 If you or someone you love has a big heart and a penchant for stray pets, you'll love our impressive, 360-degree, almost three foot tall bronze childhood statue. Expertly finished with a hand-applied, classic sepia bronze patina accented by an antiqued emerald verde patina to bring out the amazing detail. Cast and crafted one piece at a time in the traditional lost wax method, which highlights the detail of the sculpt and guarantees lasting beauty. 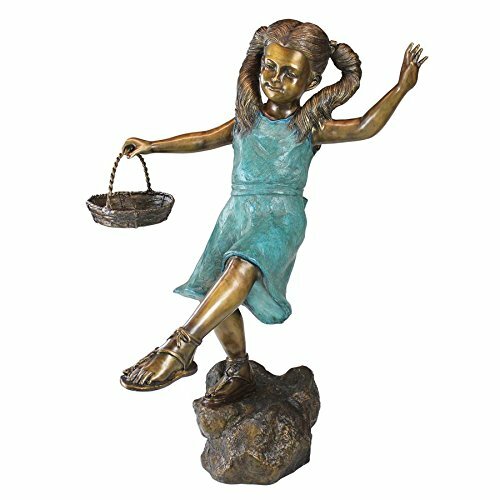 Sure to be a garden focal point, this Design Toscano, heirloom-quality bronze girl statue conveys that you take the exterior of your home as seriously as the interior. 13"Wx12"Dx35"H. 35 lbs. With cold nose, slurping tongue and big wet kisses, this little girl's canine companion enthusiastically shows his love! 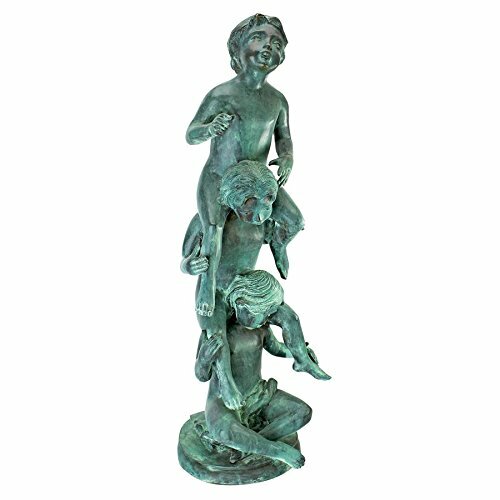 Our impressive, 360-degree, almost three foot tall bronze childhood statue is expertly finished with a hand-applied, classic sepia bronze patina accented by an antiqued emerald Verde patina to bring out the amazing detail. Cast and crafted one piece at a time in the traditional lost wax method, which highlights the detail of the sculpt and guarantees lasting beauty. Sure to be a garden focal point sitting on your patio chair or garden wall, this Design Toscano, heirloom-quality bronze girl statue conveys that you take the exterior of your home as seriously as the interior. 12½"Wx11"Dx30½"H. 34 lbs. Add a symphony of cascading water to your pool or pond as a delightfully lyrical stream dances from the swirled shell innocently offered up by this beautiful young girl. Our distinctive, 360-degree, one-and-a-half-foot tall bronze seaside statue is expertly finished with a hand-applied, classic sepia bronze patina accented by an antiqued emerald Verde patina to bring out the amazing detail. Cast and crafted one piece at a time in the traditional lost wax method, which highlights the detail of the sculpt and guarantees lasting beauty. Sure to be a garden focal point, this Design Toscano, heirloom-quality bronze youth statue conveys that you take the exterior of your home as seriously as the interior. Piped so you may optionally cascade flowing water from the 290 GPH pump into your pond or fountain. Simply add the optional recirculating pond pump kit to create beautiful water music for your garden. Accommodates Toscano Pump Kit DR-290, sold separately. 16"Wx11"Dx19"H. 21 lbs. 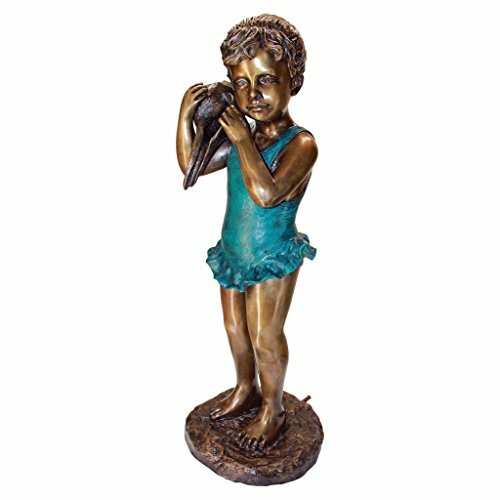 Capturing the idyllic spirit of childhood play, our bronze child statue is a charming year-round reminder of "fun in the sun" for any pond, fountain or garden. Giggling and sitting astride each other's shoulders, these three playmates evoke memories of summer's giddy madness. Because our Design Toscano-exclusive heavyweight masterpiece is cast using the age-old lost wax bronze method, it will continue to gain character as its patina mellows with time. Piped to optionally cascade flowing water from the top child's mouth into your pond or fountain. Accommodates Pump Kit HS-75300. Color patina is applied by hand one piece at a time, tone may vary slightly. Medium: 7"Wx8and 1/2"Dx25and 1/2"H. 19 lbs. The legendary Manneken Pis, standing in Brussels for more than three centuries, is now a work of garden art ready to grace your own home! 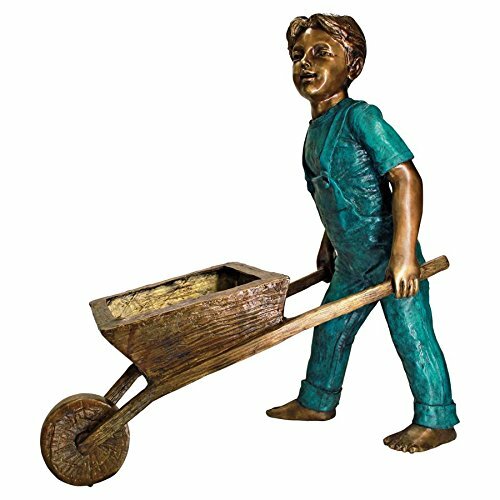 Our distinctive, 360-degree, over-foot-and-a-half-tall bronze boy statue is expertly finished with a hand-applied, classic emerald Verde bronze patina to bring out the amazing detail. Cast and crafted one piece at a time in the traditional lost wax method, which highlights the detail of the sculpt and guarantees lasting beauty. Sure to be a garden focal point, this heirloom-quality bronze classic European style statue conveys that you take the exterior of your home as seriously as the interior. Piped so you may optionally cascade flowing water into your pond or fountain. Simply add the optional recirculating 120 GPH pond pump kit to create beautiful water music for your garden. Accommodates Toscano Kit Pump Kit DR-120, sold separately. 7½"Wx6"Dx20"H. 10 lbs. With her nose in a book, this two-tone bronze statue creates a tranquil reflective spot in home or garden. 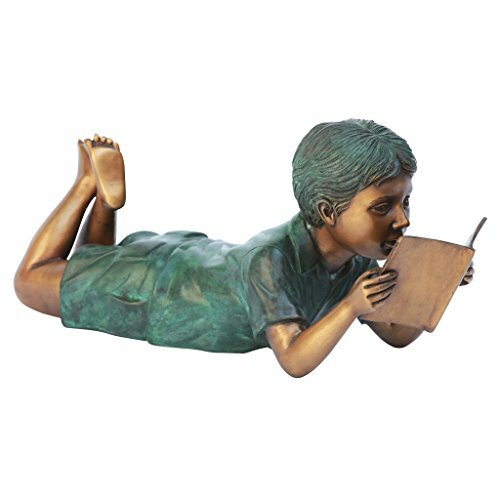 Our impressive 360-degree child reading statue boasts a stunning hand-applied classic sepia and emerald Verde bronze patina. Cast and crafted one piece at a time in the traditional lost wax method, which highlights the detail of sculpt and guarantees lasting beauty. Sure to be a garden focal point, this Design Toscano heirloom-quality bronze, reading child statue conveys that you take the exterior of your home as seriously as the interior. 4½"Wx11"Dx12½"H. 9 lbs. 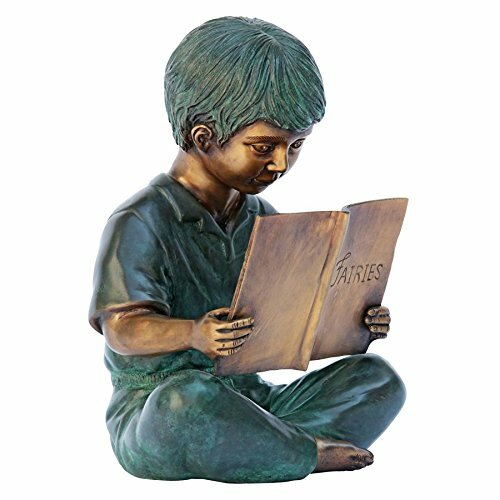 This exquisitely detailed, two-tone solid bronze reading boy statue creates a spot for quiet reflection in home or garden. The folds of fabric, waves of hair, and the curl of bare toes all contribute to the sense of immersion and calm serenity in this tranquil, bronze bookworm statue poised with his nose in an open book. Our impressive 360-degree statue boasts a stunning hand-applied two-tone, classic sepia and emerald Verde bronze patina. Cast and crafted one piece at a time in the traditional lost wax method, which highlights the detail of sculpt and guarantees lasting beauty. Sure to be a garden focal point, this Design Toscano heirloom-quality bronze, reading child statue conveys that you take the exterior of your home as seriously as the interior. 6"Wx18"Dx7"H. 8 lbs. With his nose in a book, this two-tone bronze statue creates a tranquil reflective spot in home or garden. 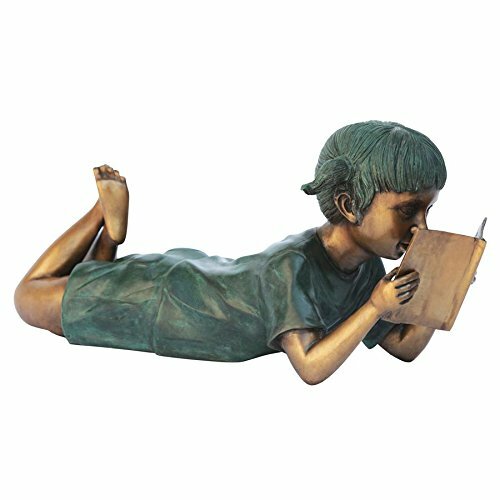 Our impressive 360-degree child reading statue boasts a stunning hand-applied classic sepia and emerald Verde bronze patina. Cast and crafted one piece at a time in the traditional lost wax method, which highlights the detail of sculpt and guarantees lasting beauty. Sure to be a garden focal point, this Design Toscano heirloom-quality bronze, reading child statue conveys that you take the exterior of your home as seriously as the interior. 8½"Wx8"Dx12"H. 9 lbs. 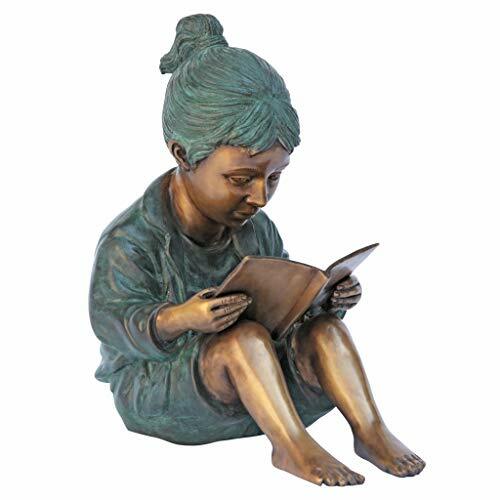 This exquisitely detailed, two-tone solid bronze reading girl statue creates a spot for quiet reflection in home or garden. The folds of fabric, waves of hair, and the curl of bare toes all contribute to the sense of immersion and calm serenity in this tranquil, bronze bookworm statue poised with her nose in an open book. Our impressive 360-degree statue boasts a stunning hand-applied two-tone, classic sepia and emerald Verde bronze patina. Cast and crafted one piece at a time in the traditional lost wax method, which highlights the detail of sculpt and guarantees lasting beauty. Sure to be a garden focal point, this Design Toscano heirloom-quality bronze, reading child statue conveys that you take the exterior of your home as seriously as the interior. 6"Wx17"Dx8"H. 8 lbs. As children, backyards and forests held equally fascinating treasures to scoop up and carry home in pockets or a basket! 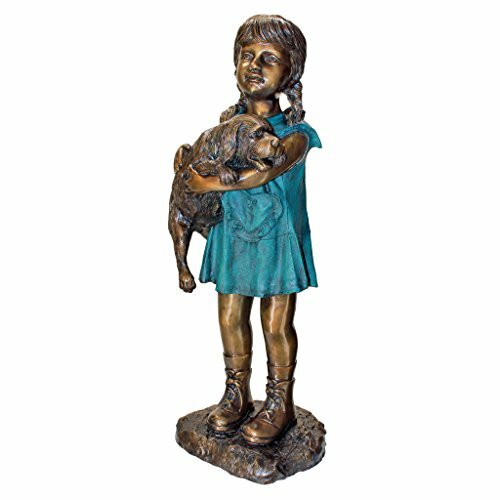 Relive the thrill of the hunt across life's stepping stones with our nostalgic, 360-degree, over three foot tall bronze childhood statue, expertly finished with a hand-applied, classic sepia bronze patina accented by an antiqued emerald verde patina to bring out the amazing detail. Cast and crafted one piece at a time in the traditional lost wax method, which highlights the detail of the sculpt and guarantees lasting beauty. Sure to be a garden focal point, this Design Toscano, heirloom-quality bronze statue conveys that you take the exterior of your home as seriously as the interior. 29½"Wx27"Dx42"H. 50 lbs.